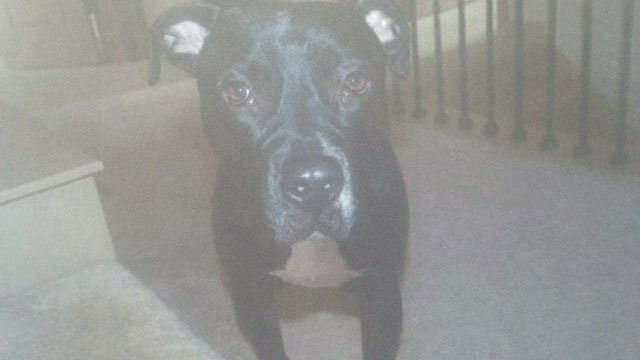 A Gwinnett County judge Wednesday ordered that a PIT BULL l be euthanized after the dog attacked a grandmother in the front yard of the home next door. The attack happened last Thursday on Huddlestone Lane in a subdivision in Buford called The Enclave at Ivy Creek. The victim, 57-year-old Kyung Ae Kim of Korea, is in the country visiting her daughters. According to testimony, she was approaching her daughter's front door when the neighbor's dog escaped from an open garage door and attacked her. "She saw the garage door opening and then she heard, 'Stop!' and the dog's name," said her daughter Soo Jeong. During the attack, the grandmother held up her forearm to protect her face and neck. The dog's teeth ripped into her arm, causing a serious wound. Her daughter told CBS46 her mother will have to spend the rest of her vacation undergoing medical treatments. According to Gwinnett County code, after a dog bites someone, the animal must be quarantined for 10 days. The dog is being held at the Gwinnett County Animal Shelter where it continues to show aggression, according to an animal control officer's testimony. At Wednesday's hearing, the dog's owner Maheesh Gajjar pleaded guilty to charges of having a dog at large and attack without provocation. Jeong said the same dog showed aggression toward her in 2015, jumping on her and scratching her. She said she didn't report it then because the dog's owners asked her not to. Judge Patricia Muise ordered Gajjar to surrender the dog to Gwinnett County Animal Control to be euthanized. She sentenced Gajjar to 12 months probation, during which time he is not allowed to have a domestic animal in his home and cannot have contact with animals. He must pay a $500 fine and $235 in restitution to the animal control division. The family of the victim is planning to file a civil lawsuit against the Gajjars in an effort to recover the cost of future medical bills. A woman in Gwinnett County was attacked by a PIT BULL MIX last Thursday. She said the dog went after her while she was in her daughter's front yard. It happened in Buford off Kilgore and Buford Drive. Kyung Ae Kim, 57, is here from Korea visiting her daughters. But now she'll have to spend the rest of her vacation with her arm in a sling after she says a pit bull mix ran up to her, started biting and wouldn’t let go. "She saw the garage door opening and then she heard, 'Stop!' and the dog's name," said her daughter, Soo. After getting loose from the house next door, Kim said the dog grabbed her arm, although it was initially going for her neck. "The dog was just jumping on her and then she feels like she's pretty sure the dog was biting her neck or face, so she was trying to protect her face." Because she was shielding her face, her arm now has a chunk bitten out of it. Kim has months of recovery ahead and a doctor told her she may never get the sensation in that part of her arm back. "I just feel so bad because she’s visiting us," Soo said. After a dog bites someone in Gwinnett County they must be quarantined for 10 days. The dog is being held at the Gwinnett County Animal Shelter. Soo said the same dog attacked her in 2015 but she didn't report it then because her neighbors asked her not to. "They're refusing to put the dog down," said Kim's attorney, Joseph Zdrilich. "They're going to fight for the dog and they've been confrontational with my client."